MinibarRX is a stand-alone joint venture of affiliates of Minibar Systems (the world’s largest maker of refrigerated platforms to the hospitality industry) and affiliates of InstantDX (a pioneer in electronic prescribing and healthcare-transaction services). Since 2013, the combined companies have been working in stealth mode to develop its MinibarRX platform, now available worldwide to the physician and hospital markets. Leveraging the power of both companies, MinibarRX is the industry’s first “internet of things” (IoT) platform for medical-grade refrigerators—a truly “smart” refrigerator and “hardware as a service” (HaaS). 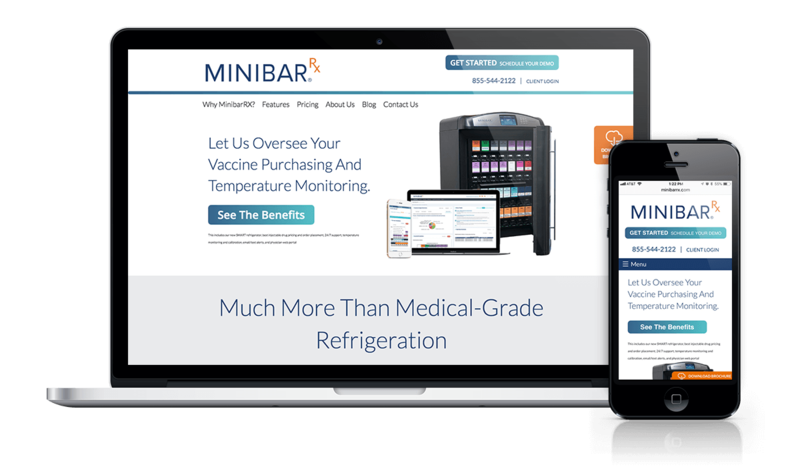 MinibarRX connects the physician’s EMR and practice management system to an in-office refrigerated drug-dispensing system, closing the gap on patient-level drug lot number and expiry data. MinibarRX needed to redesign and relaunch their website. Additionally, they needed their new website to provide better support for their sales team. The biggest challenge for MinibarRX was presenting a leading edge product to physicians so they could clearly understand the value proposition. We worked closely with MinibarRX senior staff and sales team to create a resource that clearly articulated the value proposition and benefits of this innovative service.